Comfortable and nice apartment for 4 persons in Balatonboglár. Distances: beach 500 m, shopping 100 m, restaurant 100 m, train 1000 m, swimming pool 100 m, sports field 100 m.
Upper floor: 2 twin bedrooms. American living room with dining area, satellite TV, kitchenette. 2 bathrooms with shower and toilet. Equipment: gas stove, refrigerator, German coffee machine, microwave, terrace with garden furniture. 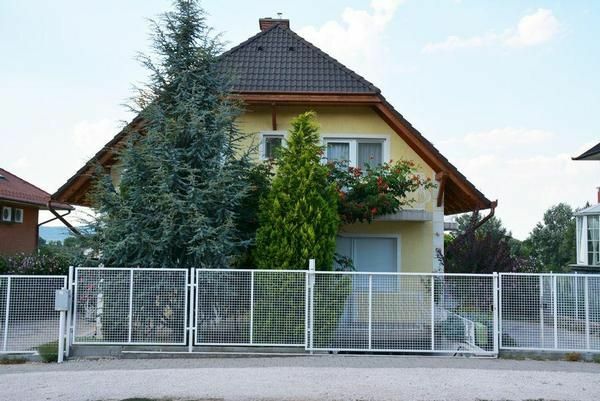 Info: Comfortable furnished two-storey house in a sunny and idyllic location of 500 meters from Lake Balaton, in a quiet street. This house consists of 4 apartments. These apartments are surrounded by a large, enclosed garden property with meadow, trees, flowers and shrubs. The property is surrounded by a fence. The owner does not live there. This holiday home for several groups is very ideal, which want to be together as well as a private life. If you do not feel like eating in one of the many good restaurants, there is also the possibility to have a barbecue in the garden. Parking on the property. The Balaton, in German Balaton, is a lake in the west of Hungary, which is also the largest lake in Western and Central Europe with a size of 594 km ². Due to the small depth of 3.25 m on average, the lake has a relatively high water temperature, which can rise in the summer up to 30 degrees. A hotel or holiday home on Lake Balaton is therefore ideal for a beach holiday, but Balaton is also popular as a destination for a favorable spa holiday, as there are several important spas around the lake. Sporty active holidaymakers can sail, surf or fish and the network of cycle paths around the lake has been renewed and expanded in recent years. Winegrowing also has more than 2000 years of tradition at Lake Balaton, dating back to the Romans. A holiday apartment or guest house on Lake Balaton therefore offers the beautiful opportunity to combine a beach holiday with a holiday on the vineyard. Why Balatonboglár? If you want to feel like hunting, horseback riding, fishing have, or specific values ​​of music, visual arts measured or simply admire nature - with us you can find everything in Balatonboglár and close. Almost right on the lake there are 14 tennis courts under the shade of the beautiful plane trees, where international tournaments are held in the places you can rent. We await with special experiences. The last Saturday of July is the day when every year überzuschwimmen try to Balaton from Révfülöp to Balatonboglár thousands. The distance is 5.2 km. Also you can put their endurance on the scale. on 20. August, the Wine Festival, the beginning of the grape harvest and wine festival. Several days of this joyful festival where the new members of BONUS BONORUM her vow, the winegrowers keep their competition and the Wine Queen is elected. In the main season every weekend musicians and folk dancers entertain the guests, connected with a market. - Excursions from local agencies u. a. in the Pusta and to Budapest, Danube bend, Balatonrundfahrt, Burgspiele, Eszterházy cellar party, goulash party, Csárdás evening, Gypsy evening, wine tasting evening, country wedding ... etc. Internet (per object and day, included in the price 0 EUR). Parking (per object and day, included in the price 0 EUR). Water (per object and day, included in the price 0 EUR).